Fevers are no fun, but they are part of our natural defense against viruses! A fever, a headache, or diarrhea is no fun. Many of us reach for a Tylenol, Pepto Bismol, or some other form of pain relief when we are suffering from one of these symptoms, and they do tend to make us feel better. But are we making the right choice? Symptoms like fever, headache, and diarrhea are the body’s way of expressing exactly what it needs to express at that moment. I think we can all agree that our body has an Innate Intelligence that is far superior to the intelligence of modern science; in other words, our body knows exactly what needs to be done to heal. 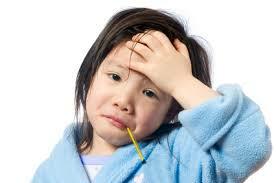 Fever, for example, is the body’s defense mechanism to deal with viruses and harmful bacteria. Most harmful bacteria and viruses are classified as mesophiles, which prefer temperatures around 37 degrees Celsius, the normal temperature of the human body. When the body detects one of these invaders it cranks up the heat to kill the virus or bacteria, so why would we want to stop this process? Very high fevers, above 105 degrees Fahrenheit can cause neurological problems, but these types of fevers are very rare. It is completely normal to run a fever of 102-103 degrees in order for the body to rid itself of any foreign invaders. Headache is another symptom that should be embraced, not suppressed. A headache can be an early warning sign to a myriad of issues. Many times headaches are related to dehydration, lack of sleep, or stress. This is our body’s way of telling us that we need to take better care of ourselves. Taking a Tylenol or Advil makes you feel better and allows you to continue to pound away at the body, but in the end you are doing further damage. Diarrhea is probably not the subject you want to discuss at a dinner party, but we have all experienced it at one time or another. It can be stress related, but many times this is our body’s method for expelling foreign invaders (at times violently). Again, I must question why anyone would want to slow this process down? When you take Pepto Bismol or some other anti-diarrhea medicine you are effectively keeping these harmful invaders in your body longer, which gives an increased opportunity for infection. The “flood gates” are open for a reason, why would you want to shut them? Practicing what I preach…my daughter complained of a stomachache this weekend on Saturday night. I had her drink some water and put her to bed, hoping that she would wake up feeling better. When I woke her up Sunday morning to start getting ready for church she said her stomach still hurt. I told her that we would stay home and to go back to sleep. She ended up sleeping until noon! But when she woke up, she felt great! The stomachache was completely gone. I could have given her Pepto Bismol or something to make her feel better, but I would have risked interfering with the body’s normal function. Why would I do that? I have more confidence in the Innate Intelligence of the human body than the wisdom of the chemists who created Pepto. All of these symptoms fall into the early warning sign category. Similar to the check engine light on your dashboard-fevers, headaches, and diarrhea can be indicative of more serious dysfunction if they persist. I would encourage you to seek out a healthcare provider that seeks out a cause for these symptoms and addresses the underlying stressor that is triggering the response.